As a startup, is it better to pay more attention to product or sales? In long-run, what would bring lasting success for startups? 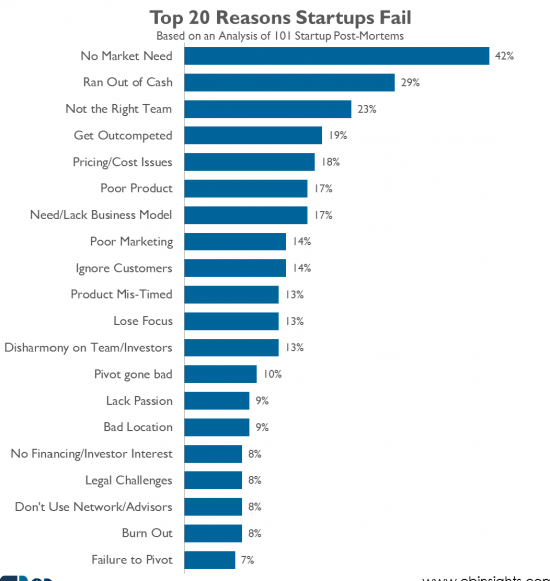 A recent study shows that over 17% of startups fail because of poor products and the top reasons for startups failure is creating a product no one needs. Does that suggest that focusing your energy on creating the best product is more important than sales? If that’s your notion, you’ve got to think again. Consider that sales fuel your company and keep it alive. In fact, one study shows that 53% of customer loyalty is driven by the sales experience. Now, you can see how important it’s to have a great sales team for your startup. New products are launched every day. And millions of dollars are spent yearly developing and launching these products. Some are sales-driven created by sales founders; however, others are product-driven also created by product experts. What is a product-driven startup really? A product-driven company focuses on what their product brings to the table and strives to improve it continually. They believe that a great product most often sells itself. A product-driven startup ensures that customers get value out of their product. Product-driven companies are mostly dominated by product teams, such as engineering, user experience, and product experts. Product-driven leadership has a background in product management rather than sales. Steve Jobs is an example of a successful product-driven founder. He built a company focused entirely on delivering the best product to their customers. Apple was largely operated on the “build it and they’ll come strategy” — they created the iPod even before the market new they actually needed it. Another great example of a successful product-driven founder is Elon Musk. He spends over 80% of his time with his designers and engineering team developing next-generation products. I can’t agree with Wertz enough on this “It’s typically much easier to add sales expertize to a product-driven organization than it is to add product focus to a sales-driven start-up,” these successful product-driven companies carefully incorporated sales-driven business to their companies. When you have a great product behind you, it’s easier to woo customers. Besides, a company can hire a senior sales executive to refine their sales and distribution strategy, however, on the flip side, a great product requires great leadership with the right product mindset which is usually not easy to add to a sales-driven startup. A sales-driven startup focuses on what sells or attracts attention rather than what works and provide real long-term value to customers. Sales-driven companies are often aggressive in maximizing short-term return on investment and this mindset can shape product decisions a great deal. Every startup needs sales. As mentioned earlier, it’s the fuel that keeps your startup alive. Of course, you’ll go out of business if you don’t have enough sales to keep up with your business. However, one of the major drawbacks of a sales driven company is that they lack resources to service their customers beyond the initial sales. So this business model tends to work well for a service organization. Every salesman knows this: In most organizations, salespeople work under immense pressure. You have to make a sale. You either meet your quota or nothing. With that mindset, it can lead the salesperson to even exaggerate their product’s value and at the end of the day, you lose the customer after their first business with your company. Sales-centric organizations don’t really bother much about why a customer leaves their business because they’re really not ready to fix it. All they need is a new customer that is willing to pay. Saying all this doesn’t mean that sales-driven organizations are bad, moreover, companies like Oracle which is basically a sales-driven company has seen a lot of successes. The hiding place for any sales-driven company will be to eventually become a service company by creating and incorporating all the features users expect to get from their product. i). Listen to your customers first: Always look out for ways to meet your customer's expectation—bearing in mind that customers pay higher for a better customer service. Sam Walton, founder of WalMart started his retailer business in rural America. He chose this place because he was aware that people who lived in suburban areas will need goods in larger quantities as they had larger families or needed more goods to keep their own small businesses running. Walton listened to the customers and now it is the most powerful, largest brick and mortar retailer in the world. At first, it seems challenging but you must listen to your customers. ii). Aim for results: Take on surveys, find out why customers leave and try to improve. Do all you can to deliver results and bring satisfaction to your customers? Feedbacks from customers both positive and negative are very helpful to make important decisions. Feedbacks help to analyze and make better decisions to improve customer service and productivity. iii). Your values should be shared: Let every employee be aware of your company’s value and how they can be implemented, too. iv). Put more emphasis on training your employees: Invest in training your employees. If they have the right orientation, they’ll definitely treat your customers well. Training sessions will develop understanding and skills in your employees and this will ultimately help to achieve business goals. New technologies are increasingly emerging into the consumer’s market lately and it’s obvious, users are more interested in what a product can offer and how they enjoy their experience with the product at their workplaces to enable them to stay productive. A study by IDG in 2014 shows that LinkedIn, Skype and other consumer or individual services are the cloud tools mostly used by employees (90%), followed by file sharing or collaboration tools (79%). With the consumer apps ecosystem becoming more diverse, businesses and IT teams will need to adapt their approaches to how employees do business. Give employees the flexibility to work with tools that empower them. But also keep security, administration, and mobile device management in mind. Now that consumer products are carefully penetrating the market, the demand for better products is getting so much attention nowadays. To really see success in your startup you shouldn’t choose between being sales-driven or product-driven. Learn to combine the two practices to see significant success. In fact, you need to focus so much on your sales and distribution strategy because no matter how good a product is they usually don’t make money on their own. As a result, product-driven companies need to focus on distribution in order to succeed in the long-term. Therefore, products and sales are extremely important and should be taken seriously. A great product will boost your marketing efforts, generate more sales and repeat customers provided you have got a great customer experience. Sales and customer satisfaction are the lifeblood of your company—so ensure you make sales but not to the detriment of your customers.